Russet Street Reno: "All work and no play...."
Does it also remind you of the hotel in The Shining? 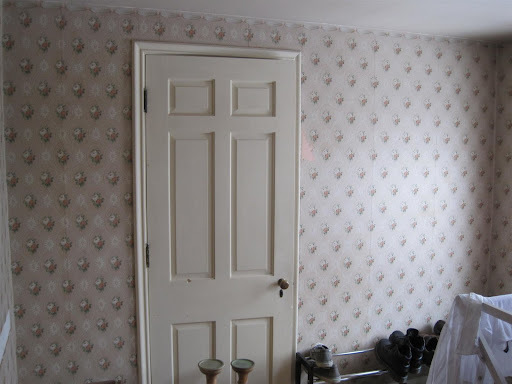 Floral wallpaper, pinky peach molding, water stains on the walls, this room had it all. Except the twins. And psychos. If I could find words to describe a killer stabbing noise, I would type it here. Don't worry, we dabbed a little Herpecin-L on those spots and it's looking much better. Our ceiling can date with confidence now. 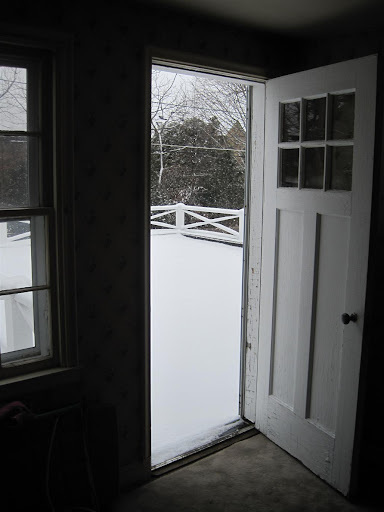 It is freezing cold in this room, we have to get a storm door for this entrance. That poor door is weeping water through the panels because there isn't anything blocking it from the elements. And you know I hate to see a good door suffer. Anywho, the only place in the room that we could put furniture is the short wall near the window, helpfully outlined in red above. What would you do with a room that you couldn't put furniture in? I'll give you my plan for the room tomorrow and see if you thought of the same thing as me! Ha! I just got the post title. Clever! If I had this room, I probably would actually use it for a sewing room. Or I would put a giant fluffy chair there that was solely for drinking hot chocolate. Is that the door you normally come in through? Could it be a super awesome mudroom? Bench, place for coats, shoes, mail, etc...? 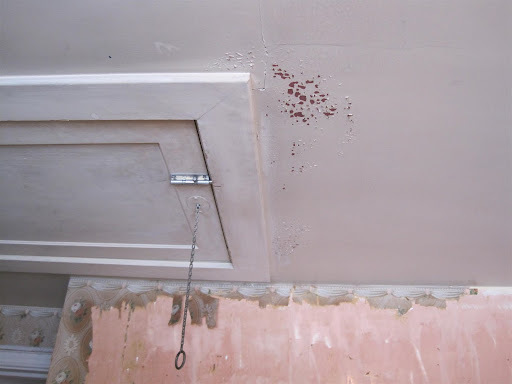 PS If your room's ceiling herpes come back, you can introduce it to our third bedroom which also has a nasty case. that cedar closet is way awesome! I have a room like that also with a door in it. It is very challenging to put furniture in. Amanda - I would love to help you design your small kitch! If I could sew, that is what this room would be for me as well. E - The door actually leads to our deck above the garage, I wish it led to the driveway because it would be perfect for a mudroom. I would either make it into an office, with a corner desk along the wall where the shoes are, and under the window. Or make it into a sewing room? Can someone please explain to the naieve Australian what makes the cedar closet? ohmygosh that is too funny. am i a weirdo for finding something a teensy bit charming about that paper (minus the scary parts)? not enough to not paint over it, though! So that's it, it's just a regular closet? I had been thinking for months that it was some sort of special thing, that was better for your clothes or something! Now I just feel silly! 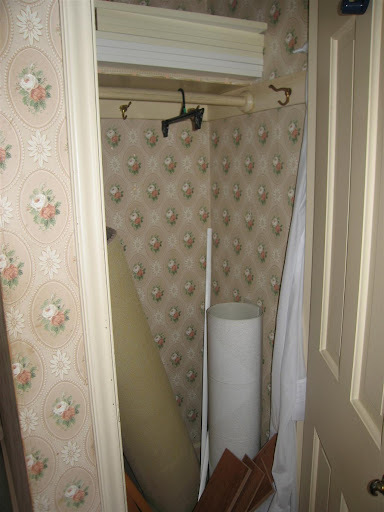 All our closets are just plain plaster inside. 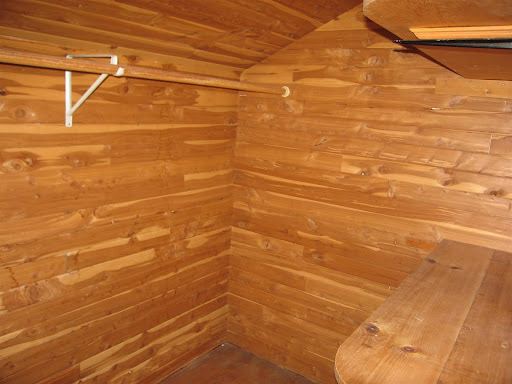 hahahah that cedar closet totally does look like a sauna! way, cool, though! 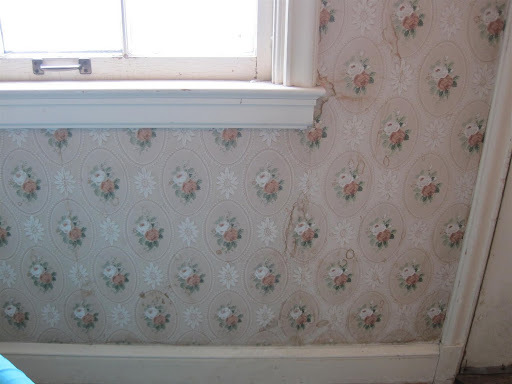 wowza - that is horrible wallpaper! It is very shining-esque!! i can't wait to see your plans for the room!! April - cedar is known for repelling moths and other pests, which is why you can buy cedar blocks and hangers for your closet. However, our closet is very old and isn't very aromatic anymore. I would totally... TOTALLY... put a tall bookcase there and fill it with lovely books and charming, modern knick-knacks (not too many - no clutter! ), and then in the other area(s) of the room, a nice chair to read in. Maybe a teensy side table for that cup of hot chocolate (mentioned by a previous commenter)? I laughed out loud when I read "This window apparently had a drooling problem." Ha. Uf, you guys definitely have your hands full with this little room. I'm going to guess you'd use the room as a closet or (I'm going on a limb here) a dark room since you just received that awesome camera! I'm looking forward to the transformation. Looking forward to hearing your plan! 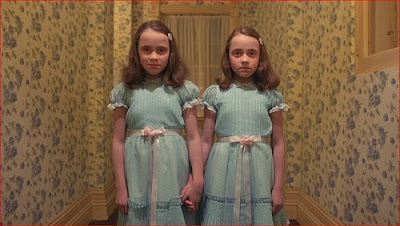 The Shining reference totally cracked me up! Seriously good eye. It looks so much like that room. Creepy! I'm assuming that if you'd heard children's laughter and 'redrum' late at night, you would have mentioned it by now. Too bad it's not quite right for a mudroom! That would have been adorable! But I can't wait to see what you do with this! I too cannot wait to see what you do with it because it is such a design challenge with all the doors. I am predicting a reading nook or maybe closet. I love the deck over the garage...do you guys use it a lot? If you use that outside door as an entry point to your home, it could be a mudroom. If that was my home, I'd use it as a safe room for my dogs to play and sleep while I'm at work, especially since there's an exterior door. We have a bedroom that is 8x8 and we use it as a home office. We have shelves attached to the wall with a long table underneath. 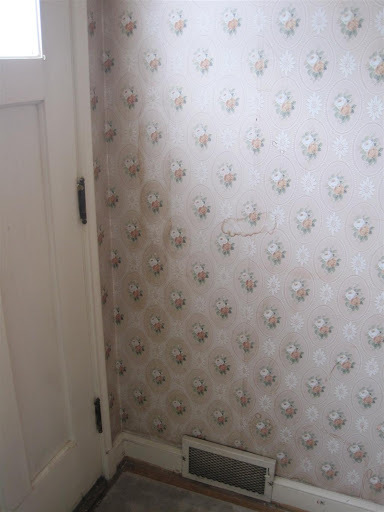 I love removing wall paper. My forearms looked great after spritzing and scraping walls throughout one of our fixer uppers. Can't wait to see the plans. I'm still laughing at the ceiling herpes. And, that it can now date. Hilarity. Where is this room in relation to other rooms in your house? Could it be a mudroom? I just don't know. Can't wait to see what you come up with. I agree that you could put some tall bookcases (or at least one) and put a comfy reading chair in a corner. Or if the room is big enough (it's hard for me to visualize sizes and I don't have a tape measure handy), you could put a round table in the middle for playing cards or something? Dunno. That's a tough one alright. Are you planning to use the deck for entertaining? 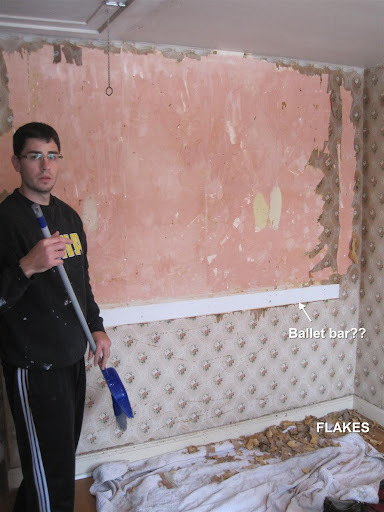 If so, you could put a wet or dry bar in for easy access during parties. This had me laughing loudly. I'm in the OBGYN field, so the idea of the ceiling having herpes was just too much.